In preparation for your free site visit, it is necessary to have a sense of your electricity needs. For a grid-tie solar system, it is helpful to pull together your electricity usage data in kilowatt-hours for the past 12 months. This information can be found on a years’ worth of monthly utility bill statements, or you can contact your utility directly for this data. If Xcel Energy is your electricity provider, you can acquire your annual electricity usage in kilowatt-hours online at http://www.xcelenergy.com or by calling 800.895.4999. 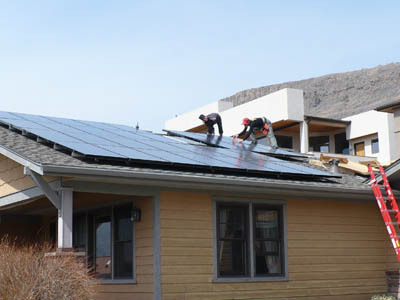 Scheduling a site visit is a risk-free, no-obligation way to see if a PV solar system is a good option for you. Click here to schedule your free site visit now. “Photovoltaic” is a term used to describe the solar technology utilized to generate electricity. The abbreviation PV often is used to refer to solar electricity systems—in contrast to systems that heat water, which are called “solar thermal” systems. When they are struck by energy from the sun’s rays, the panels’ photovoltaic technology generates electrical voltage and current. This energy is measured in watts. 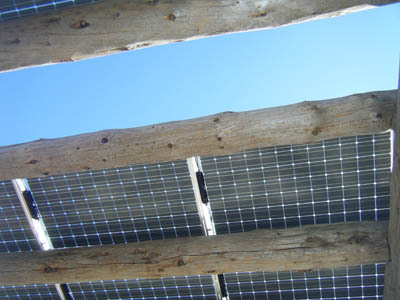 A solar electric system installed on a home or business and connected to the electrical utility company’s service at the same time is called a grid-tie solar system. A system like this uses net metering. When the solar system is producing more energy than you’re using—during the day—your electric meter spins backward, giving you credit for generating your own electricity. When you start using energy in the evening your meter spins forward, drawing from the utility grid. Because the solar system produces some or all of your electrical power, you only pay the utility company for the net energy that you use from the grid.